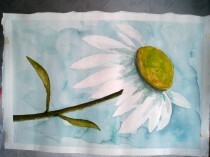 A pretty simple water color painting of a little white flower. It’s one of my favour flowers which was quite commonly seen in parks in the past. But now it becomes more rare. Even though many parks were built in the last decade, the diversity of plants in local parks seems decreased.